Sample ballots for the upcoming August 28th Primary Election were mailed to households with registered voters who have not been issued early ballots. The polling place for the voters is listed on the sample ballot. In addition to polling places, Coconino County will also have three vote centers where registered voters in Coconino County may go to vote on Election Day. Voters may cast their ballots on Election Day at any vote center in the jurisdiction, regardless of their residential address. The vote centers are: NAU Walkup Skydome, Flagstaff; Flagstaff Mall (next to JCPenney), Flagstaff; and the Tuba City High School Warrior Pavilion, Tuba City. “The vote centers will give voters that work in Flagstaff or Tuba City the convenience of voting closer to their workplace instead of having to drive home to vote,” stated County Recorder Patty Hansen. Polling places and vote centers will be open 6:00 am to 7:00 pm local time on Election Day. Voters that vote at the polling place or vote center on Election Day will need to meet the identification requirements to cast a regular ballot. For a list of acceptable IDs to vote go to the Elections Office webpage: www.coconino.az.gov/elections and select “List of Acceptable ID for Voting”. Coconino County voters that have been mailed an early ballot may drop off their voted early ballot sealed in the return ballot envelope at any Coconino County polling place or vote center during the hours that the voting location is open on Election Day. Voted early ballots must have the voter’s signature on the outside of the return envelope. Early ballots from other counties or states should not be dropped off at Coconino County polling places or vote centers because they will not be able to be counted. 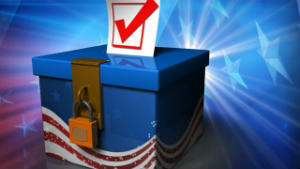 Early ballots from other counties or states need to be returned to the county that issued the early ballot. For more information you can call the Elections Office at 800-793-6181 or 928-679-7860.